In spite of the Thanksgiving holiday festivities I've been making steady progress on Geese Migration. So far I've kept up with my goal to make one block a day. Each block consists of five flying geese with the same solid sky/wings (I'm never sure what to call the pieces/parts) flanked by five rows of three assorted squares. In studying the pattern picture, it seemed that the maker made most of the blocks in graded values of a single color, so that is the approach I am taking. I am using my Japanese taupe collection enhanced by other fabrics in my stash that have "the look" of Japanese taupes. Even though the nature of Japanese taupes is very subdued, there is a surprising amount of color in those prints. Still, it has been challenging to keep the subtle "mood" while inserting color to make it more interesting. I am really looking forward to seeing this finished, but Christmas projects will be taking priority over the next few weeks. Today I need to get started (and hopefully finish) a small wall hanging for SIL's mountain cabin. The pattern I planned to use will make it too big to fit in the space between her living room windows so I will probably just add some borders and callerdun! She had requested something for Christmas but I thought this panel was not so in-your-face-Christmas and could carry over into the winter months. Check out what others are working on at Patchwork Times. The pattern is "Geese Migration"
by Cynthia Brunz who blogs at QuiltingIsMoreFunThanHousework. The pattern and a tutorial, available through Mary Fons' Dear Quilty, can be found here. Even with everything else I need to accomplish today, I managed to stitch a test block. Senior grocery shopping is done; now to put everything away and vacuum-pack the meat to make room in the fridge for Thanksgiving essentials. I'm going easy this year -- just the three of us for Turkey Day. Son-1 and family will come Friday afternoon and stay for a casual potato bar dinner. Yesterday, a horrible crashing sound came from the Queen Mother's Suite. As I raced in to help I found the sitter propping up the antique secretary and saw items from the secretary, including a Christmas tree and a bag of York Peppermint Patties, in bed with Mother! I'd have laughed if the sitter hadn't been in obvious need of assistance. I guess this afternoon we'll be swapping some furniture with pieces in the storage unit. Maybe I should title this post "Why Is It? Wednesday." Why is it that calamities happen at the worst possible time? Why is it that all the toilet paper rolls run out just before company comes? Why is it the grocery is out of the key ingredient needed for the Thanksgiving menu? Why does the washer have an error message when there's no chance of getting a service call on a holiday? Hop over to Freshly Pieced to see what others are working on this WIP Wednesday. Or, at least the "lugubrious." I didn't bother to look up the meaning. Nann, I'm surprised you didn't catch me on that! I had a former boss who'd ask me if I'd had a lugubrious weekend and I'd say "if that means well-oiled, then yes." So let's just stick with having a PLEASANT Thanksgiving!!! ..As if I need another project! The Japanese taupes I purchased at Lolly's in Shipshewana were calling to me. I had recently found a pattern in a magazine that I felt would be a good match. 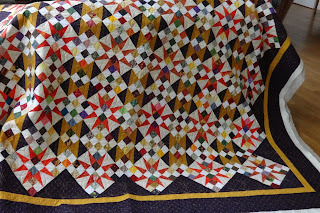 Looking at the picture (which I forgot to photograph) it appears the designer used three different fabrics in five values (light to dark) in each block. And it looks like there is very little repetition in the 25 blocks. That's 375 fabrics!! Fortunately I had purchased a roll of 40 strips as a starting point! You probably know how it goes. Inspiration strikes and you start searching the stash for what might go with recent purchases and before you know it you have a pile of potential candidates. Such was my case and I decided rather than earmark/isolate a large collection of fabric for this project or, worse, put it all back on the shelves and lose track of it, I should just go ahead and cut what is required. THEN put it back on the shelves. So this was my "design" cutting table on Monday. I have cut eight 2-1/2" squares from each strip. (As it turns out, three times what I need.) My plan is to start construction as leaders/enders as I finish up some end-of-year sewing obligations over the next few weeks. Safe travels to those on the road this week. I hope everyone has a pleasant and lugubrious Thanksgiving! made using Karin Hellaby's technique from Sew Simple Pineapple. In case you missed it, I posted a brief tutorial here. It all started with a small pack of fat sixths (12" x 22") of yellow and gray prints that I was using in the sample step-outs for my Exploding Pineapple class at Quilt Camp at Cedar Lakes. The resulting blocks were so pretty I decided to make a whole quilt, but the sixths were not big enough. Several shopping trips later, I was set to go bigger. With 81 blocks finished, I was ready to pick a sashing/lattice fabric. At the risk of repeating myself, I wanted to sash the blocks because the casual construction method doesn't guarantee points are going to match. Plus all edges are on the bias and I feel sashing will stabilize them. AND I wanted the quilt to be a bit bigger. ...but it is a bit busy and blends too much. My second choice was too heavy. My final choice is just right! I've added it to the right side of all the blocks. Once I decide on the final arrangement I'll add the left side sashing on the first block of each row. I will wait until the S'mores Christmas retreat where there will be a large enough design wall to do a complete layout. Actually, I'm home now. Guess where I was last week! One can't go to Shipshe without allowing time for shopping. And shop I did! Five quilt shops in one day. My wallet is busted! The stash report is so busted I'm not even going to count anymore! I did get the one critical thing I was looking for -- a sashing fabric for my gray/yellow pineapple blocks. Several large cuts of backgrounds, two 3-yard wide backs, and a roll of taupe strips round out the purchases. I am trying to convince myself that it all has a purpose ... OK, if I live long enough. But it sure was fun! The gray/yellow pineapple blocks will go back up on the wall today with the latest sashing option. More on the sashing situation later. Hop over to Patchwork Times to see more design walls this Monday. It pleases me to announce that Not Your Grandmother's Log Cabin revised edition will be released next week and is available for preorder here. Like many authors recently, Marci Baker and Sara Nephew have affiliated with C&T Publishing. 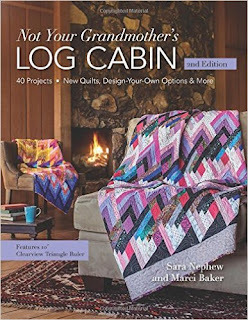 The revised edition includes six new quilt patterns as well as a "design your own" section. There is a lot of conversation on the "proper" way to hand-turn a binding. ... with the quilt in my lap and the edge on the table/counter. I stitch from right to left. I have friends who rest the quilt on the table with the binding closest to them. Which way do you turn a binding? I say, "whatever floats your boat" as long as the result is the same! I spent most of Saturday at the kitchen counter stitching down the binding on "Royal Wedding" (Cathedral Stars). My goal is to get it done in time to enter in a local quilt show next weekend. While stitching inside, I kept a discrete eye on the "tree guys" working on our hill outside. Their last task was to cut down two small dead trees by the driveway that were a threat to any cars parked underneath. I am surprised what a difference removing those two spindly trees makes in my view from the kitchen! After the tree guys (I know there must be a proper term for them) had left, I went out to "survey the acreage," as Daddy Bill used to say. The back hill looks much neater with the dead trees and downed limbs out of the way. And I was happy to see that the garden angel was doing his job in collecting leaves. I tried to catch the gorgeous sunset, but my camera was not liking the low light. The blur is kind of artistic, isn't it. At least you can see the stunning color. ... TV, tablet, USB-powered LED light/fan, Clover Wonder Clips, Clover needle threader, scissors, Thread Heaven, 40-weight thread, and the critical glass of zinfandel. The binding was counted out when I made it, so another week with nothing in and nothing out. I finished 81 Exploding Pineapple blocks, enough to do a 9 x 9 setting! And, in case you missed it, I posted a brief tutorial on the technique earlier this week! Once I get the blocks squared up (why do we say square up when we're downsizing our blocks? ), they'll go into a box with assorted potential border and backing fabrics in preparation for the S'mores Christmas retreat. I may have found the perfect sashing fabric in one of my recent purchases. I'll experiment with this in between some hand sewing this weekend. I am frantically turning the binding on two quilts to be entered into a local quilt show. Why do I wait till the last minute? Well, it was not a complete finish, but definitely worthy of a happy dance so I'll be linking up with Sarah at Confessions of a Fabric Addict. While working on my yellow and grey Exploding Pineapple, I've received questions about how the technique works and why I'm considering certain things for finishing. So I've prepared a short tutorial for making pineapple blocks using the technique developed by Karin Hellaby and featured in her pattern booklet, Sew Simple Pineapple. Be aware. this is NOT a traditional pineapple. In fact, the technique can be a little slapdash; in any case it's far from an exact science! But it's a lot of fun to do and there is no special ruler required or paper to tear off at the end, either. The booklet gives several sizes for starting squares -- I started with 2-3/4" -- but you could start with any size square. You might want to fussy cut motifs from a fabric or use small panel prints as your starting point. and take a little snip along the other line. Stitch 1/4" from the edge around all 4 sides. It's probably not as accurate as running off the end of each side, but I like to leave my needle down at the line, raise the presser foot, and pivot the piece to line up the next edge with my foot. Remember, I said this is not an exact science! I finger press as I go and when I have accumulated a pile of blocks I take them to the ironing board for a good PRESS. Don't overwork the iron at this point or you risk distorting the bias edges. It is not necessary to trim the dog-ears or square up at any point unless you have a problem with shadowing through a particular fabric. Trimming can be done later if it's an issue. Mine came out roughly 3-1/8" Yes, it's a weird, but necessary, measurement. Draw diagonal lines on the next size square, snip as before, then place it on top of this square-in-a-square block, right sides together. Do not stress over the fact that the edges don't exactly line up. You will use the edge of the top square as your guide for sewing; the uneveness will disappear in the seam. Cut on the diagonal lines of the top fabric only, and peel back the triangles as before. Measure again, cut the next square and repeat the process untill your pineapple block is as big as you want it. Mine uses five different sized squares and will finish at 6-1/4". Again, the pattern gives specific measurements for several different starting sizes. If you are working from a different starting point (or are not using the pattern as your guide), it's important that you measure at each stage and arrive at an average size to cut all the next size squares the same. Frankly, there's a pretty good YouTube video demonstrating this process probably better than I can show you. You can see it here. Several people asked me why I plan to add sashing/lattice to my blocks. First, even though the blocks look nice butted up to each other on the design wall, the casual construction technique results in points that do not all fall at the same place. I think I would drive myself crazy trying to match the points! More importantly, however, is the consideration that all the outside edges are bias and I feel like sashing will add some overall stability. So that's it! I hope you will try it. 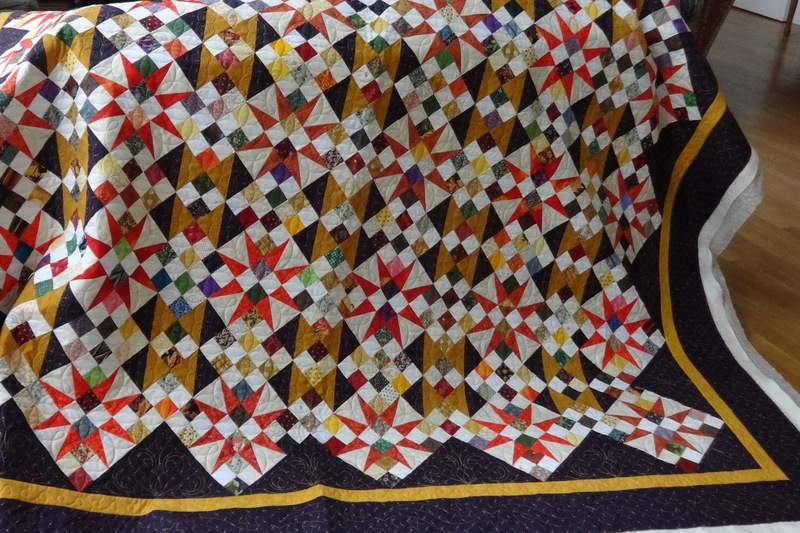 You might end up like Peggy in my Quilt Camp class who said it's so much fun she is going to make 1,000 blocks! Do you back yourself into corners? For someone who generally likes to plan, I find myself backed into corners of my own making more often than I want to admit. Y'all will probably think I'm silly; but remember, I have that obsessive/compulsive side of my brain that wants demands order. I started this version of Exploding Pineapple as class samples/step-outs, but liked the grey/yellow combo so much I decided to make a whole quilt. While I intended to be random in my fabric choices for each block, my plan was to have half finish in grey and half finish in yellow so that I could alternate placement. But some greys are light and some are dark, just as some yellows are light and some dark. The dark yellow on the left is not only ugly, but just the wrong shade of yellow, even though it's from the same Andover collection (Lilliana) as the black on the right and the gray at the bottom. I would favor the black border print except that it is 8 inches wide and I think would dominate the quilt. The gray at the bottom would need an inner border for separation (maybe a bit of the ugly yellow ...). Decisions, decisions .... I will post a tutorial tomorrow and perhaps will be able to tell you which direction I will take. Stay tuned. And hop over to Patchwork Times to see if anyone else gets into corners like I do.